You’ve been building your business, researching investors, and preparing your pitch deck. The time has come to consolidate all your hard work into a quick pitch to investors - sometimes only a few minutes long - that could make or break your chances of securing the funding you need. Are you ready? We know you’ve done your research on how to craft the perfect pitch, but knowing what not to do is just as important as knowing what to do. 1. Bringing the whole team - and only letting the founder(s) or CEO speak. Investors know that a company’s most important asset is its people. Having the rest of the team stand in the background while the leader does all the talk is a waste of an opportunity to show that your business has this critical piece of the puzzle. How will investors gauge the quality of your team if they never hear them talk? Don’t give the impression that the leader’s words are the only ones that matter in your business. 2. Avoiding any mention of competitors. If you only have a few minutes to wow investors with the potential of your business, competition might be the last thing you feel like talking about. But investors are practical people. They know you have competition (don’t even bother trying to convince them that your product is unique) and will ask about this if you don’t tell them. Show them your savvy by telling them before they ask. 3. Asking the investor to sign a non-disclosure agreement (NDA). From the entrepreneur’s perspective, it makes sense to protect the secrets of a business’s inner workings with an NDA. From a seasoned investor’s perspective, it signals a mountain of extra paperwork and an entrepreneur with little awareness of how the business world works. The nature of their work means that investors meet with a lot of businesses, some of which may be your rivals. It’s unlikely that your idea will be stolen, but if you’re worried, do your homework on each investor you pitch to and make sure they’re worth the risk. 4. Lying or giving vague answers to the investor’s questions. The investor is asking these questions for a reason. Dancing around the truth in order to make your business look better or dismissing the question with a vague answer will backfire. Rather than forcing out a hasty reply, consider why they might be asking this question and answer accordingly. A slower reply that is honest and deliberate is worth more than a quick, smooth reply that fails to provide the information the investor needs. 5. Meeting with your best potential investor first. It’s tempting to take the earliest opportunity to pitch to your favourite investor, but avoid making them your first pitch. Like most skills, your pitching will improve with practice, and your nervousness will fade. Practice your pitch - but don’t overdo it and sound like a robot - with mentors and business-savvy friends, then try it out on an investor less likely to be a good match. Overcoming tough competition and winning the attention of busy investors is difficult even for seasoned entrepreneurs. 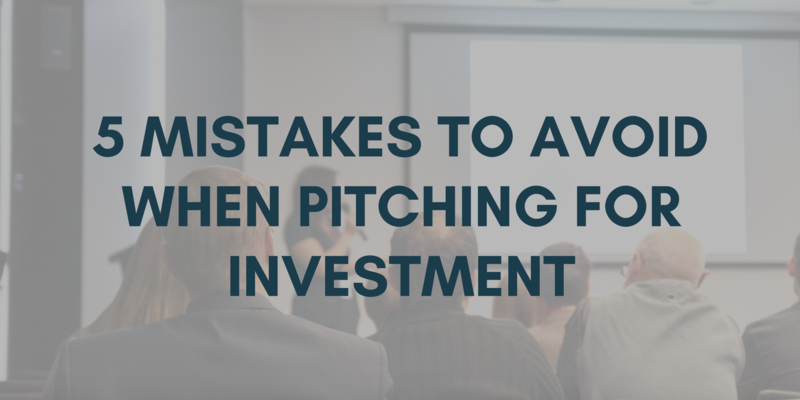 Increase your odds by ensuring these easily avoidable mistakes don’t sink your otherwise fantastic pitch! Want more tips for delivering the perfect pitch? Join us for our next event, ‘Pitch Perfect! Secrets revealed’, on 4 April at 5:30 p.m. at WeWork Aldgate Tower. Five businesses will pitch to a panel of expert judges and receive valuable feedback you won’t want to miss. Learn more and secure your ticket here!